And the 2016 Herb of the Year is – peppers! The University of Illinois Extension McLean County Master Gardeners are ready to celebrate! Join them 9:30 a.m. on July 16 at the Illinois State University Horticulture Center, where the Master Gardeners will utilize their recently planted herb garden to demonstrate what the pepper (Capsicum spp.) has to offer. To be chosen as Herb of the Year, an herb must be deemed outstanding in two out of three categories – medicinal, culinary and decorative – by the International Herb Association (IHA). The IHA is an organization that has been naming the herb of the year for the last 21 years. Favorites such as basil, rosemary, lavender and fennel have won the title in past years. Many people might not know why peppers would win this honor, or even realize that they are considered an herb, but peppers boast strengths in all three categories. Did you know that peppers have chemicals in the fruit called capsaicin that have medicinal properties? The benefits they offer range from pain relief to digestion issues. The Master Gardeners will show you how to make an ointment from peppers, a must-try if you are looking for relief from the aches and pains of lots of gardening. Most great recipes would not be complete without key spices such as cayenne, chili peppers, or paprika. The culinary uses of peppers are endless, and the McLean County Master Gardeners are well known for utilizing ingredients from their gardens to prepare delicious dishes. At this event, they will demonstrate how to prepare some of their favorite recipes and offer tastings. Peppers are a true decorative edible. They come in bright, sun-saturated colors, with their large, boxy globes or shiny ornaments covering the entire plant. Fruits are ripened when full color and easy to pluck from the plant. 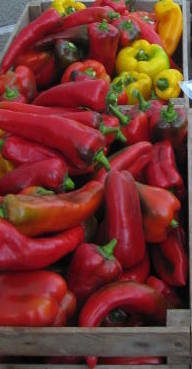 Hot peppers typically are harvested when red. However, this is not an indication of hotness. Beyond those three categories, peppers offer additional benefits in that they are easy to care for and provide key vitamins when consumed. Peppers begin producing fruits after about two months with minimal care. Depending on the type, they offer either large or multiple fruits. Peppers do require consistent watering and need to be watered when temperatures are high and rain is limited. They will also benefit from a fertilizer treatment of 10-10-10 at first planting and again at the first flush of flowers, however, they will not produce fruit if over-fertilized. Nutritionally, for as few as 25-30 calories for a medium-sized fruit, you get all of the Vitamin A and C that you would need in an entire day. Don't miss out the opportunity to explore this "must grow plant" and find out more about why it deserves this honor from IHA! This program will be held outdoors and is subject to cancellation due to inclement weather.